Totally Unique, Vendome brings together the finest luxuries available. In a world of mass production, the immeasurable qualities of hand made items are easily overlooked or even misunderstood. 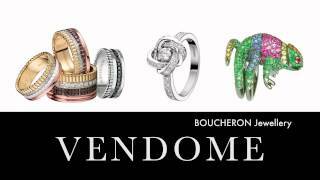 Vendome exclusively stocks, Boucheron Jewellery, Faberge Jewellery, Pomellato Jewellery, six brands of unique and independent Watches (including Romain Jerome, DeWitt), Charriol, Phillip Stein),, Globe-Trotter Luggage, Roland Iten Mechanical Luxuries. HENK Luxury Luggage. Individualism is hard to find for those who really understand the beauty of genuine hand made items and the pleasure they deliver in the knowledge that this is an individual and not a clone. Vendome brings you a selection of the finest luxury items, each a handcrafted classic. If you are looking for the perfect gift, that one item for the one who has everything, or that unique creation - Vendome is for you.